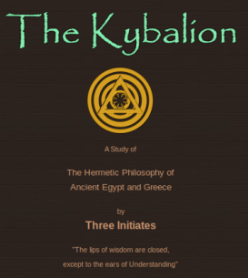 Part 2A Chapter3 through Chapter7 contains detailed explanations of the First Hermetic Principle and its applications to raise the spiritual levels of the practitioners. 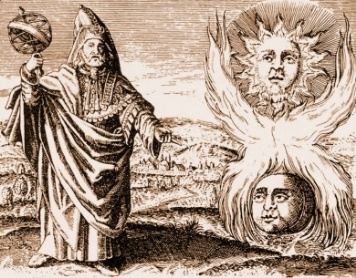 The Hermetists were the original alchemists, astrologers, and psychologists, Hermes having been the founder of these schools of thought. From astrology has grown modern astronomy; from alchemy has grown modern chemistry; from the mystic psychology has grown the modern psychology of the schools. The word “Transmute” means “to change from one nature, form, or substance, into another; to transform”. “Mental Transmutation” means the art of changing and transforming mental states, forms, and conditions, into others. As a matter of fact, none but advanced Mental Alchemists have been able to attain the degree of power necessary to control the grosser physical conditions, such as the control of the elements of Nature; the production or cessation of tempests; the production and cessation of earthquakes and other great physical phenomena. The first of the Hermetic Seven Principles–the Principle of Mentalism, explains the truth that “THE ALL is Mind; the Universe is Mental”. It is really the Basic Principle of the whole Hermetic Philosophy, and of the Hermetic Art of Mental Transmutation. Under and behind all outward appearances or manifestations, there must always be a Substantial Reality. Man considering the Universe, sees nothing but change in matter, energy, and mental states. He sees that nothing really IS, but that everything is BECOMING and CHANGING. Nothing stands still – everything is being born, growing, dying – the very instant a thing reaches its height, it begins to decline–the law of rhythm is in constant operation–there is no reality, enduring quality, fixity, or substantiality in anything– nothing is permanent but Change. He sees all things evolving from other things, and resolving into other things–constant action and reaction; inflow and outflow; building up and tearing down; creation and destruction; birth, growth and death. Nothing endures but Change. In these lessons, we have followed the example of some of the world’s greatest thinkers –the Hermetic Masters–and have called this Underlying Power–this Substantial Reality–by the Hermetic name of “THE ALL”. The Hermetists believe and teach that THE ALL, “in itself,” is and must ever be UNKNOWABLE. They regard all the theories, guesses and speculations of the theologians and metaphysicians regarding the inner nature of THE ALL, as but the childish efforts of mortal minds to grasp the secret of the Infinite. One pursuing such inquiries travels around and around in the labyrinth of thought. He is like the squirrel which frantically runs around and around the circling treadmill wheel of his cage, traveling ever and yet reaching nowhere–at the end a prisoner still, and standing just where he started. It must be Infinite in Power, or Absolute, for there is nothing to limit, restrict, restrain, confine, disturb or condition it–it is subject to no other Power. (3) THE ALL must be IMMUTABLE, or not subject to change in its real nature. It cannot be added to nor subtracted from. It must have always been, and must always remain. THE ALL being Infinite, Absolute, Eternal and Unchangeable; it must follow that anything finite, changeable, fleeting, and conditioned cannot be THE ALL. THE ALL is SPIRIT! Spirit means “the Real Essence”. Spirit transcends our understanding. Following the Principle of Correspondence, we are justified in considering that THE ALL creates the Universe MENTALLY, in a manner akin to the process whereby Man creates Mental Images. THE ALL can create in no other way except mentally, without either using material, or else reproducing itself. Death is not real, even in the Relative sense–it is but Birth to a new life–and You shall go on, and on, and on, to higher and still higher planes of life, for eons upon eons of time. “As above, so below,” remember, and the phenomena of one plane may be employed to solve the riddles of higher or lower planes. “The half-wise, recognizing the comparative unreality of the Universe, imagine that they may defy its Laws — such are vain and presumptuous fools, and they are broken against the rocks and torn asunder by the elements by reason of their folly. The truly wise, knowing the nature of the Universe, use Law against laws; the higher against the lower; and by the Art of Alchemy transmute that which is undesirable into that which is worthy, and thus triumph. While to THE INFINITE ALL, the Universe, its Laws, its Powers, its life, its Phenomena, are as things witnessed in the state of Meditation or Dream; yet to all that is Finite, the Universe must be treated as Real, and life, and action, and thought, must be based thereupon, accordingly, although with an ever understanding of the Higher Truth. And if Man, owing to half-wisdom, acts and lives and thinks of the Universe as merely a dream (akin to his own finite dreams) then indeed does it so become for him, and like a sleep-walker he stumbles ever around and around in a circle, making no progress, and being forced into an awakening at last by his falling bruised and bleeding over the Natural Laws which he ignored. The first thought that comes to the thinking man after he realizes the truth that the Universe is a Mental Creation of THE ALL, is that the Universe and all that it contains is a mere illusion; an unreality; against which idea his instincts revolt. But like all other great truths, must be considered both from the Absolute and the Relative points of view. From the Absolute viewpoint,, the Universe is in the nature of an illusion, a dream, a phantasmagoria, as compared to THE ALL in itself. Anything that has a beginning and an ending must be, in a sense, unreal and untrue. From the Absolute point of view, there is nothing Real except THE ALL. Whether the Universe be created of Matter, or whether it be a Mental Creation in the Mind of THE ALL–it is unsubstantial, non-enduring, a thing of time, space and change. But the Absolute point of view shows merely one side of the picture–the other side is the Relative one. To the finite minds forming a part of that Universe, and viewing it through mortal faculties, the Universe is very real indeed, and must be so considered. The Laws of the Universe are none the less “Iron Laws” because of the mental nature. All, except THE ALL, are bound by them. What is IN THE INFINITE MIND OF THE ALL is REAL. We commit a folly when we attempt to deny the existence of Matter in the relative aspect. We may deny its mastery over us, but we should not attempt to ignore it in its relative aspect, at least so long as we dwell upon its plane. Nor do the Laws of Nature become less constant or effective, when we know them, likewise, to be merely mental creations. They are in full effect on the various planes. We overcome the lower laws, by applying still higher ones — and in this way only. But we cannot escape Law or rise above it entirely. Those Laws which THE ALL intends to be governing Laws are not to be defied or argued away. So long as the Universe endures, will they endure–for the Universe exists by virtue of these Laws which form its framework and which hold it together. Under any hypothesis, the Universe in its outer aspect is changing, ever-flowing, and transitory–and therefore devoid of substantiality and reality. But we are compelled to ACT AND LIVE as if the fleeting things were real and substantial. We do not live in a world of dreams, but in a Universe which, while relative, is real so far as our lives and actions are concerned. Our business in the Universe is not to deny its existence, but to LIVE, using the Laws to rise from lower to higher–living on, doing the best that we can under the circumstances arising each day, and living, so far as is possible, to our biggest ideas and ideals. In each case, the student will find that while the image has its existence, and being, solely within his own mind, yet he, the student, author, dramatist, painter, or sculptor, is, in a sense, immanent in; remaining within; or abiding within, the mental image also. In other words, the entire virtue, life, spirit, of reality in the mental image is derived from the “immanent mind” of the thinker. To take a modern example, let us say that Othello, Iago, Hamlet, Lear, Richard III, existed merely in the mind of Shakespeare, at the time of their conception or creation. And yet, Shakespeare also existed within each of these characters, giving them their vitality, spirit, and action. There are many planes of Being–many sub-planes of Life–many degrees of existence in the Universe. And all depend upon the advancement of beings in the scale, of which scale the lowest point is the grossest matter, the highest being separated only by the thinnest division from the SPIRIT of THE ALL. And, upward and onward along this Scale of Life, everything is moving. All are on the Path, whose end is THE ALL. All progress is a Returning Home. All is Upward and Onward, in spite of all seemingly contradictory appearances. Such is the message of the Illumined. The Hermetic Teachings regarding the process of Evolution are that, THE ALL, having meditated upon the beginning of the Creation–having thus established the material foundations of the Universe–having thought it into existence–then gradually awakens or rouses from its Meditation and in so doing starts into manifestation the process of Evolution, on the material mental and spiritual planes, successively and in order. Thus the upward movement begins–and all begins to move Spiritward. Matter becomes less gross; the Units spring into being; the combinations begin to form; Life appears and manifests in higher and higher forms; and Mind becomes more and more in evidence–the vibrations constantly becoming higher. In short, the entire process of Evolution, in all of its phases, begins, and proceeds according to the established “Laws of the Indrawing” process. All of this occupies aeons upon aeons of Man’s time, each aeon containing countless millions of years, but yet the Illumined inform us that the entire creation, including Involution and Evolution, of an Universe, is but “as the twinkle of the eye” to THE ALL. “WHY does THE ALL create Universes ？” Men have striven hard to answer this question, but still there is no answer worthy of the name. Strictly speaking, there cannot be said to be any “Reason” whatsoever for THE ALL to act, for a “reason” implies a “cause,” and THE ALL is above Cause and Effect. THE ALL merely “IS” — “THE ALL ACTS BECAUSE IT ACTS.” At the last, THE ALL is All Reason in Itself; All Law in Itself; All Action in Itself. The legends have it that HERMES, the Great, when asked this question by his advanced students, answered them by PRESSING HIS LIPS TIGHTLY TOGETHER and saying not a word, indicating that there WAS NO ANSWER. This entry was posted in 修心養性, 禪修 by wtsai. Bookmark the permalink.